I just finished "A Tree Grows in Brooklyn" for the first time and enjoyed it. A great followup to ATGIB is The Mighty Miss Malone. It's a juvenile book, but still so good. Thanks, Alicia! 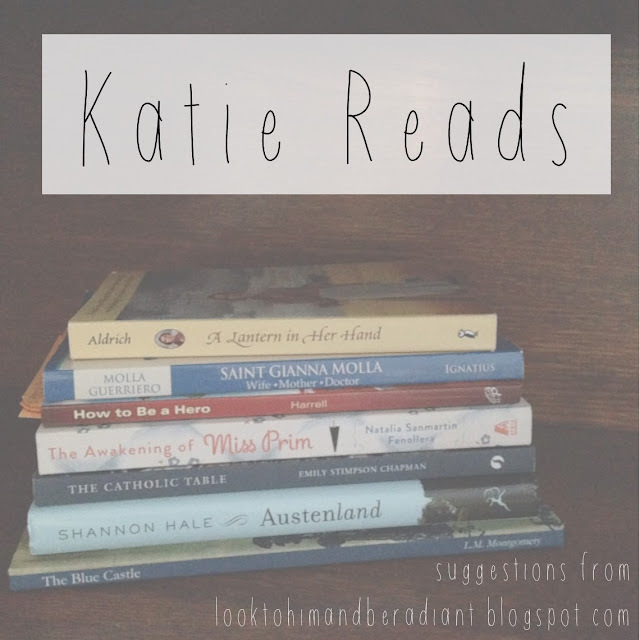 Let me know what you think of the ones you read! Oh I loved the Blue Castle, too! I'd never have found it, or Miss Prim, without Fountains of Carrots! Yay! A Lanetern in Her Hand! Yesss! I read that as a kid; my grandma and I shared a love of Pioneer stories and it makes me think of her. I HAVE to reread it now. Thank you!!! Fountains of Carrots (either Christy and Haley or the Facebook group) has been where I have found some of my favorite books lately! I just loved the Blue Castle and am glad you did too! Also! I'm not done with it yet but I'm loving The Family That Overtook Christ by M. Raymond. It was recommended by a beloved, holy priest as his favorite book and it is not disappointing. Wonderful! I'll add it to my list! I read the first 3 and loved them too! I was especially surprised with how much I enjoyed The Blue Castle. The movie Austenland was hilarious and I had no idea there was a book so thank you for that bit of info :) This week I finished Everyone Brave is Forgiven which I recommend if you're into WWII novels. I love WWII novels! I've heard of that one, but just added it to my wishlist. Thanks! Have you read All the Light We Cannot See or the Nightingale? They are in a couple of my older reviews and make my list of top WWII fiction! I've read both of those and they are definitely at the top of my list too! Everyone Brave is Forgiven isn't as good as those, but I still enjoyed it. I'm never going to live long enough to read all the books I want to read and this isn't helping. :) thanks for the recommendations, Katie! !